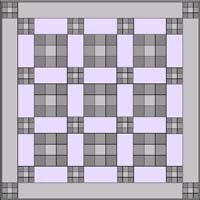 This page gives the layout, measurements and suggested quilting patterns for the doll and crib quilts. Be sure to read the information at Nine-Patch Quilts for Children before beginning. Once you have read that you will know a bit of nine-patch history and will have learned about the surprising fabrics used in the mid 19th century. This project will be a lot more fun once you have that background! Estimated yardage for the nine patch crib quilt. For the doll quilt get a fat quarter of each fabric. For the baby quilt you will want to use the following for rotary cutting. 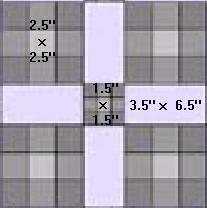 To the right you will see the layout for the nine patch doll quilt along with the sizes you need to cut the squares. The measurements include the 1/4 inch seam allowance. The finished doll quilt will be about 15" square. 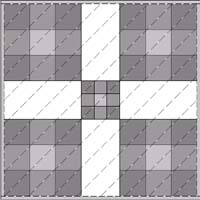 To the left is the layout of nine-patch crib quilt. Use the measurements above given for the small and large blocks. They include the seam allowance. The finished crib quilt will be about 36" square. Below are suggested quilting patterns for the crib and doll nine-patch quilts. 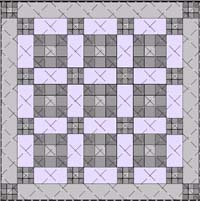 if you want an easy way to print out this free quilt pattern.